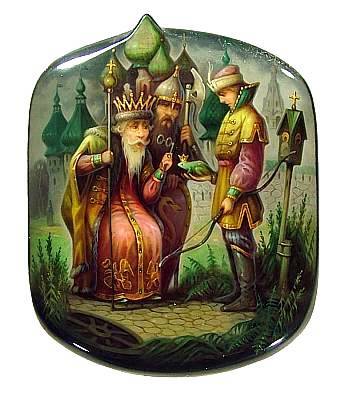 A crestfallen prince presents his father with his new bride: a frog. 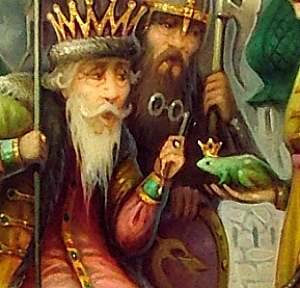 An astonished Tsar and guard marvel at the fact that the prince's arrow landed in the mouth of this creature. A hazy, gray sky serves as the backdrop for the extraordinarily detailed figures and architecture. The domes of the palace are in relief on the upper edge of the box, giving it a unique shape. 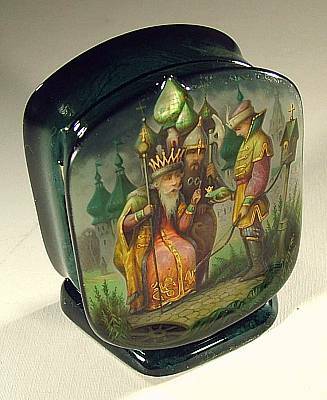 Thoughtfully placed mother-of-pearl and gold inlay give the piece an added shine, and the emerald color theme, with the frog princess at the center, aids the magical atmosphere of this work. 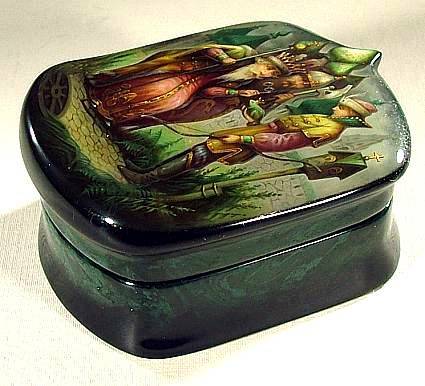 Complete with a black lacquer stand, this box is made of high quality papier mache. The interior is red lacquer. There is a hinge to the left. The piece is signed on the back with the artist's name, year, and title.